Paper summary ukrdailo This paper performs pixel-wise segmentation of the object of interest which is specified by a sentence. The model is composed of three main components: a **textual encoder**, a **video encoder**, and a **decoder**.https://i.imgur.com/gjbHNqs.png - **Textual encoder** is word2vec pre-trained model followed by 1D CNN. - **Video encoder** is a 3D CNN to obtain a visual representation of the video (can be combined with optical flow to obtain motion information). - **Decoder**. Given a sentence representation $T$ a separate filter $f^r = tanh(W^r_fT + b^r_f)$ is created to match each feature map in the video frame decoder and combined with visual features as $S^r_t = f^r * V^r_t$, for each $r$esolution at $t$imestep. The decoder is composed of sequence of transpose convolution layers to get the response map of the same size as the input video frame. Abstract: This paper strives for pixel-level segmentation of actors and their actions in video content. Different from existing works, which all learn to segment from a fixed vocabulary of actor and action pairs, we infer the segmentation from a natural language input sentence. This allows to distinguish between fine-grained actors in the same super-category, identify actor and action instances, and segment pairs that are outside of the actor and action vocabulary. 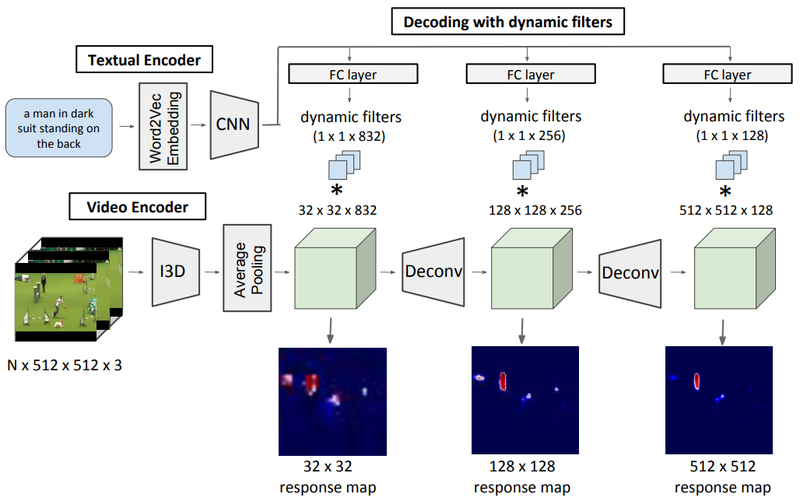 We propose a fully-convolutional model for pixel-level actor and action segmentation using an encoder-decoder architecture optimized for video. To show the potential of actor and action video segmentation from a sentence, we extend two popular actor and action datasets with more than 7,500 natural language descriptions. Experiments demonstrate the quality of the sentence-guided segmentations, the generalization ability of our model, and its advantage for traditional actor and action segmentation compared to the state-of-the-art. - **Textual encoder** is word2vec pre-trained model followed by 1D CNN. - **Video encoder** is a 3D CNN to obtain a visual representation of the video (can be combined with optical flow to obtain motion information). to match each feature map in the video frame decoder and combined with visual features as $S^r_t = f^r * V^r_t$, for each $r$esolution at $t$imestep. The decoder is composed of sequence of transpose convolution layers to get the response map of the same size as the input video frame.